Finally visited FIX after seeing and reading reviews on instagram and social media about their cakes. 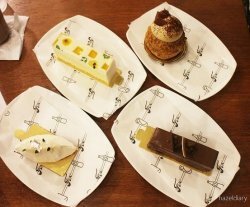 The cakes are so beautiful not to be missed out in instagram which attracts quite an attention too.FIX is an alfresco poolside café located in HomeTeam NS –JOM Club. It is hidden within the neighborhood area in Ah Hood Road. It is also the brainchild by the same owners of GRUB at BishanPark and their recent newly opened supper bar, GRUB at 221 Rangoon Road. Since my foodie partner and I wanted to try various cakes, we decided to order one main set only. Ordering and payments are to be made at the counter before foods are served to our table. 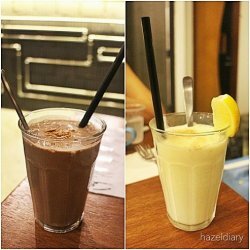 We order a main set S$14.00 which consists of Beef & Kimchi Naanwich and a glass of Chocolate, Peanut Butter, Banana Milkshake. It is quite creative to use naan to replace breads for sandwiches which is filling as it uses flour to make too. The fusion combination of beef & kimchi was just nice to compliment the bland taste of naan. The golden egg yolk that flows through the beefs, sauces and naan wrapped out the whole taste. The milkshake was recommended and true enough it tasted flavorful and rich when it is served cold. However, the drink was not cold enough after a while. And the taste after that was not that nice anymore. We ordered a glass of Lemon Curd Milkshake S$7.00 separately. Refreshing taste when it is served cold. And here comes the highlights of all where we had 4 different types of cakes. 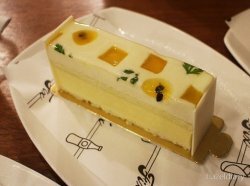 Started off with Passionfruit, mango & coconut chiffon cake S$7.00/slice. Light, soft and tender chiffon with fruity taste. It’s almost everyone favourite list. Mont Blanc S$6.00/slice that is new in the display. We ordered one to try and the sweetness was just nice and not overwhelming. But the crust was slightly hard and we have difficulties breaking it to bits to go with the topping. Perhaps it gets harder after hours of baking. Butterscotch Arabica Choux S$6.00/slice. 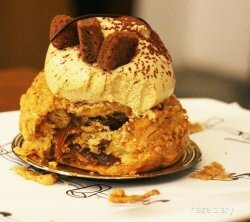 Surprising salted caramel with chocolate in the middle gives a ‘wow’ taste. 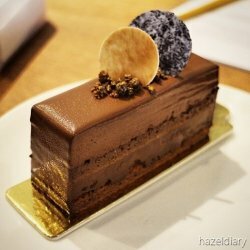 Cacao Barry Chocolate Truffle Cake S$7.00/slice. It was made with 70% cocoa. If you are a chocolate lover, you might not want to give it a miss. Total amount S$47.00 that included GST and no service charges. Servings are within 15 minutes and well-presented. 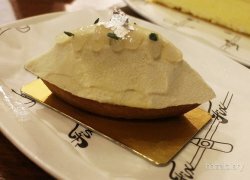 The concept original handmade goods are truly creative with the foods and desserts which can satisfy the visual and filling too. Definitely will be back for more desserts!